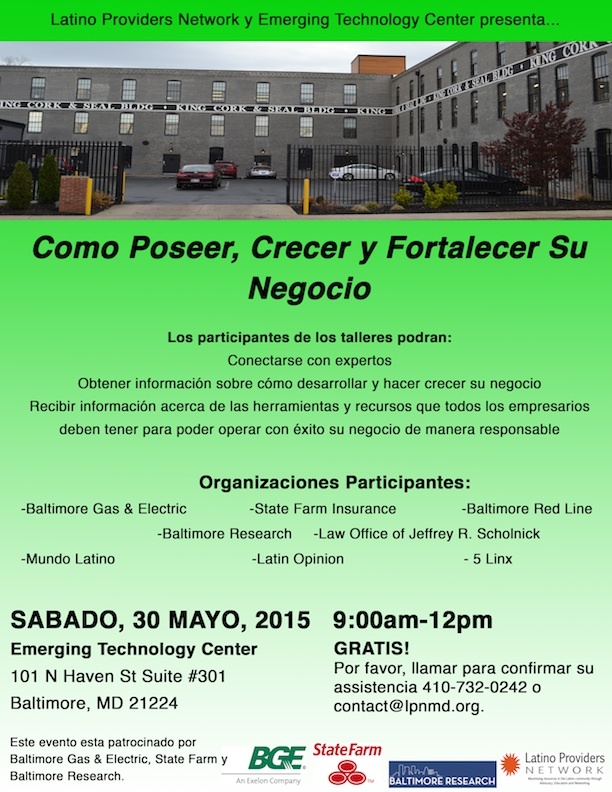 Baltimore attorney Jeff Scholnick will be a panelist for the business workshop on May 30, 2015 at The Emerging Technology Center. The workshop will begin at 9:00AM. Mr. Scholnick will be discussing unique legal issues that employers and businesses confront on a daily basis. For entrepreneurs who are willing to open their own businesses, there are many risks. These risks are compounded by differences caused by language barriers. The objective of the Business Seminar is to assist Latino business owners and entrepreneurs in accessing information and resources to further develop and grow their businesses. Businesses need to be aware of insurance issues, implications of employees’ conduct and behavior, the legal ramifications of contracts as well as other “red flags” that make owning a business such a challenge. The LPN is hosting this event as part of its educational workshop series. With a focus on business development, the LPN endeavors to contribute to building a robust business community which supports a healthy and sustainable business climate that contributes to enhancing the overall quality of life for Baltimore City.